"Verdon Township, Aitkin County, Minnesota"
The area now known as Verdon Township has a history that goes back many years. Indian peoples traveled the Mississippi River through the township for eons. Pokegama Creek undoubtedly got its name from them, and the namesake was handed down to the present day. Because of the many spearheads, arrowheads, and other relics found there, there is thought to be an old Indian camp or village located near the mouth of Two River Creek. The 1870's also saw the advent of the steamboats on the Mississippi River. 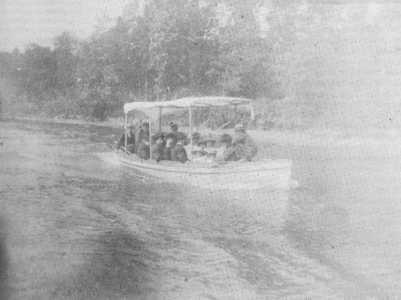 Steamboats became one of the better ways of getting around in Verdon Township. They started plying the waters in the 1880's and ran until about 1920. At times though, the steamboats were fraught with danger. Mishaps did occasionally occur as one newspaper account relates. 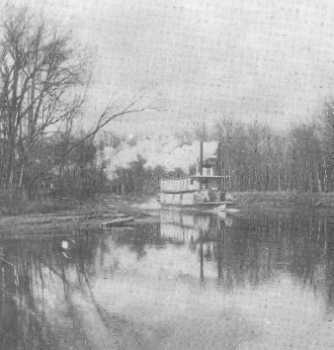 "A telephone message from Sandy Lake by way of McGregor yesterday morning to Captain Viebahn of the transportation company stated that the steamer Irene had gone to the bottom of the river near Verdon Sunday. She went up to Sandy Lake Friday to haul some lumber for the government dam work and it is not known how the accident happened. The boat was expected to arrive here Saturday night or Sunday. Captain Viebahn went up river yesterday by team to see about raising the sunken craft." 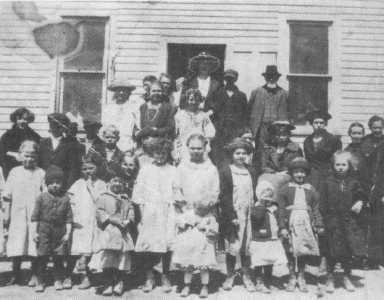 (Aitkin Age ~ May 19, 1908) After that, Harry Riggs ran a boat to ferry people to Big Sandy or up to Jacobson. The mail was also brought down in his boat. 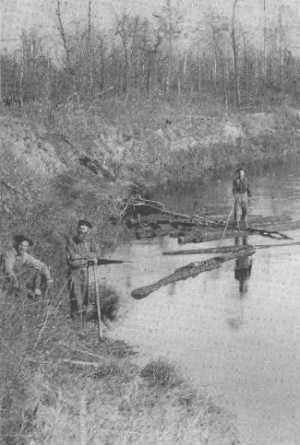 There was a rapids in the center of the township that was known as "Crooked Rapids." Often times the steamboat could not get past this rapids and was forced to turn around when the water was low. In the early years, the area was referred to by the name of Crooked Rapids. 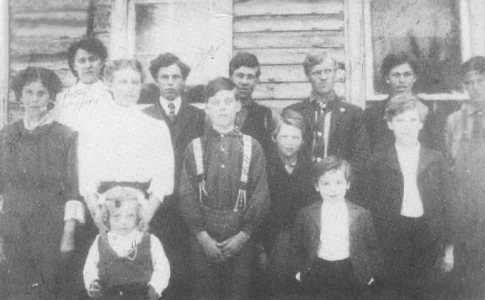 One of the early settlers was Emery Wells, who came into the area in 1898. He built a big house that was used as a stopping place for weary travelers. The basement was made with cement with rocks placed in it. Rooms were rented out to a number of loggers over the years. There was a good business for this stopping place at first, but Emery had only caught the tail end of the logging era and soon his business diminished. Once in a while a traveling minister would stop by and services were held in the house. 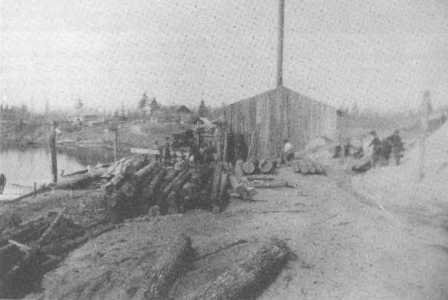 Emery Wells had built a good sized sawmill on his place. Don Wells was the fireman and the official steam engineer for the mill. The mill used slabs as fuel for the boiler. (Interview with Don Wells ~ December 6, 1995) One time a man got hurt quite badly at the mill. Andrew Devine met with a very serious accident last Thursday at the Verdon sawmill. While sawing slabs his coat caught in the saw, drawing in his right arm which was almost completely severed at the elbow. His arm was also badly torn. Devine displayed a brand of courage that won the admiration of the men at the mill. Jerking his arm free of the saw he walked to the other side of the mill and the injured member was cared for by the crew. He was then put into William Riggs' launch and hurried to Palisade in an effort to catch the Soo passenger for Superior, but missed it by a few minutes. An extra freight came along and the injured man was placed on board. A clear track was given the freight and a remarkably fast run was made to Superior where Devine was rushed to St. Mary's hospital where he received the proper care. R. W. Greenwood, who accompanied Devine to Superior, returned Sunday and reported that the injured man was doing nicely." (Hill City News ~ September 26, 1912) Wells sawed lumber for the area farmers or would sell lumber to whoever needed it. The mill ran until 1930 and eventually was sold for scrap metal during World War II. The print on the left gives the officers of the business. The print on the right says, "We have a large amount of farm and meadow land FOR SALE." Emery's son Lloyd had land on both sides of the Mississippi River. His house was on the west side while his pasture and hay lands were on the east side. This made for many crossings throughout the year. "In the winter we used to take a team across the river and bring hay over to our farm buildings that were on the west side. In the summer, we would get in a row boat and tie a rope over the head of a team and lead them across to the east side. I went to school at the Barton School and so I had to cross the river to get there. 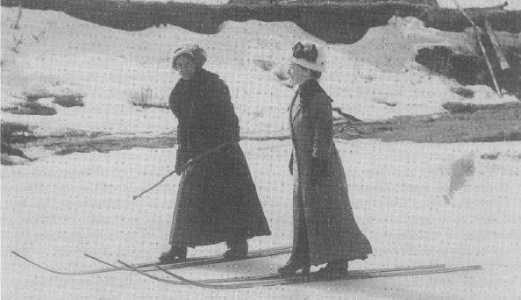 In the winter I would walk across the ice using cross country skis. In the spring, when the ice would get thinner, Dad would put planks across the ice for me to walk on. Then the ice would go out, and I would have to use a boat. In the fall, I would use a boat until the ice was strong enough to walk on. It seems strange, but I don't recall ever missing any school, so the ice must have gone out on the weekends." (Interview with Don Wells ~ December 6, 1995) Lloyd Wells did some river driving, and he was also the local blacksmith for the farmers. Another settler was Aldro Barton who came in 1901 with his father Fred Barton. Verdon Township and post office had gotten its name from Verdon Wells, son of Emery B. Wells. (Minnesota Geographic Names, by Warren Upham) The post office was organized on April 16, 1901, with Emery B. Wells as the first postmaster. On May 6, 1918, Addie Riggs took over. Rose Riggs took charge on October 6, 1919. 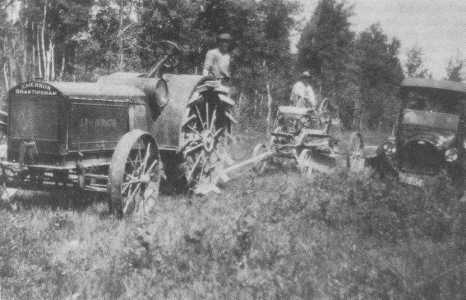 The dredges came through Verdon Township in 1910. They were dredging the Willow River, and a number of sections were dredged in the western part of the township. It had been hoped the dredges would put that part of the township into the agriculture business. There were roads built upon the ditch banks, and for a time, it seemed there was some promise to the area. Alas, it was not to be. The land remained wet and refused to cooperate with even the hardiest of farmers. One dredge was left behind for some reason, and the remains of it are still there in the southeastern corner of section 6. 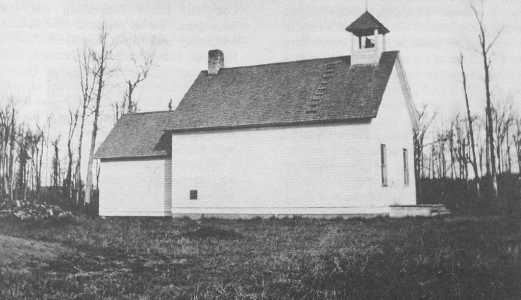 The first Verdon school was located on the west side of the Mississippi in section 27. 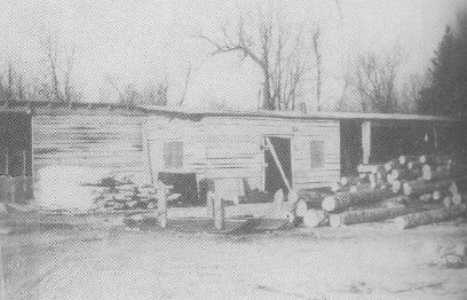 It was a log school and was built about 1898 and ran until 1913. This school was known as Verdon #1, although it was the second school built. 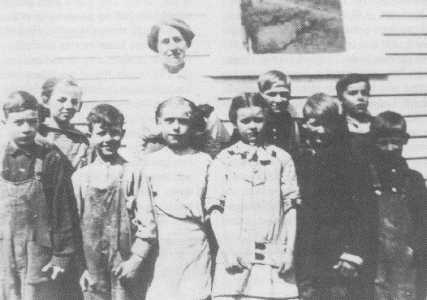 Polly Wiggins, teacher, in back. 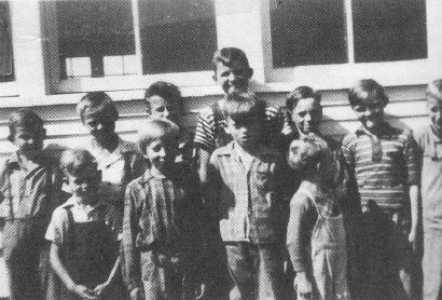 Sam Barton is far right in the back row. Ruth Barton is in front of Polly Wiggins. This school was known as Verdon #2, although it was the third school built. Others logged nearby. 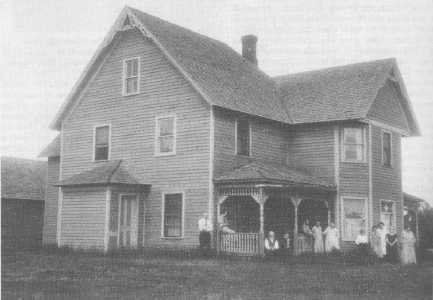 "Mike Libeck had a large logging camp north of the Weston home in section 18. All of his timber was floated (on the Willow River) down past our place. 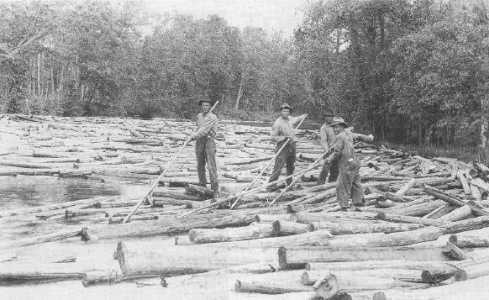 Many men were employed and one could barely see the river for the logs were so thick and piled quite high in places." (Weston Family History dated July 17, 1993) There was another camp run by the Hill City Woodenware Company in the southwestern corner of section 6. A Mr. Kangas had a camp in section 3. 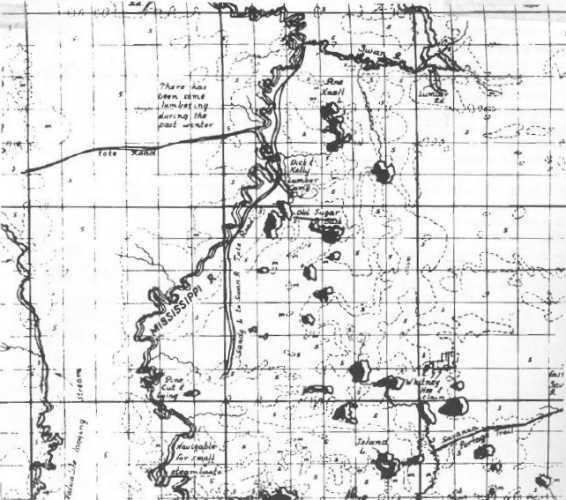 (Interview of Charlie Weston by Jim Raich ~ November 17, 1996) Elmer Lane and John Jewell each had camps in the southern part of section 7. The Westons sold poles to the mines and also to Mr. Salisbury at Rabey. A few of the neighbors got together and established their own private telephone company. The owners were Harry Riggs, Frank Riggs, J. P. Riggs and Lloyd Wells. The power source was by battery. This line was nothing more than barbed wire strung from place to place and it was even run across the Mississippi River. The township set up their own "Public" system, and Rose Riggs became the "Operator." The system was replaced by a new one in 1945. (Interview with Ray and Wayne Barton ~ November 24, 1995) The central then went to Ball Bluff. There was a pair of men on the west side of the river that owned a farm in partnership. They were Bill Liimatainen and Alex Okerman. The partnership lasted for a while, but then it went sour, and they decided to split up the farm. The line went right down the middle of the barn with the west half for Bill and east half for Alex. The rest of the farm was then also split in half. On August 9, 1969 a great storm hit Verdon Township. It came from the west where a tornado had first touched down near Emily, Minnesota. The tornado was actually three funnels. The Finn or Patterson School was lifted up and destroyed. The Erick Hillstrom place on the east side of the river was hit hard. Erick had started a campground on the river and had plans to hold barn dances. Those plans were dashed when the storm destroyed his barn. After the storm a new town hall was needed. The township had used the old school building for its meetings. Wayne Barton constructed a building out of logs that was made into the new town hall. Efforts were made in recent years to revitalize the township and its facilities. Along with the new town hall, the townspeople worked on the "Meander the Mississippi" project. "Long-term plans include the marking of historic sites up and down the river, the improvement of campgrounds, parks, trails and boat accesses, an excursion river boat, and both river boat and pioneer museums." (Aitkin Age ~ date unknown) The Verdon Cemetery was the site of the first historical marker, and three posts with a rope to represent a pier were placed there. Nostalgia reigned supreme in the 1980's as the folks got together for a couple of school reunions. One was held in August of 1980 and the other in August of 1988. It was a great time to visit and remember the "good ole days' of years past. Even some of the teachers of the one-room schools were able to make the events. In general, the people of Verdon Township have farmed and logged over the years to make a living. It is a quiet place, and the Verdon folks enjoy the way of life they have come to know.